I’m trying my best to eat according to Paleo/Primal/Real Food tenants. I’ve found that I do feel best when I go #Whole30. Seriously. Get “It Starts with Food !” You won’t regret it. I tried running for a bit a few days ago. I could go slowly, but when I tried to speed until I discovered that my ligaments are still a little sore. I still have some of the dark line so I’m not real concerned. I know it’ll all be fine eventually. I’m planning a post about my post-partum experience – a more emotionally detailed post. Look for that soon. I left her with ‘not family’ for the first time yesterday. And she was a huge hit. She was bubbly and friendly and happy. And she was also evidently the bounciest baby they’d ever seen – and this was a family that knows babies! Most importantly, she was still happy to see me when I returned. Of course. But it’s still nice to have your babe curve into you when you pick her up. She has almost grown out of some of her 6-12 month outfits. She is tall, tall, tall. We’ve got a bit of redness in her diaper-regions. But the doc says it’s just irritation, not rash. Gotta change those cloth diapers more often! Not happening. I’m at home in Canada with my family for a short while. I’m a little busy with the current circumstances. I brought my 15# kettlebell and there is a CrossFit gym here, but the kettlebell sits forlornly in the corner and the CrossFit gym isn’t gonna see me this time. It’s okay. I’ll get back at it. Muscle memory, right? 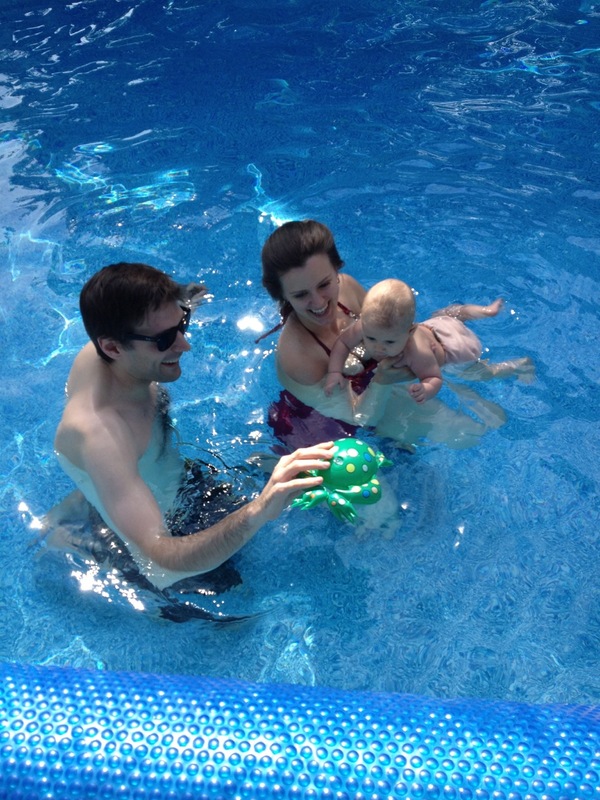 To make us all feel better, here’s a photo of the first time we took her swimming. It was one week ago. She loved it! Olivia’s first swim! 19 weeks! This entry was posted on Monday, September 3rd, 2012 at 5:36 am and is filed under Food! Glorious food!, Life, preggie. You can follow any responses to this entry through the RSS 2.0 feed. You can leave a response, or trackback from your own site.